The distant 500 meter-wide space rock was discovered by NASA in 1999 and is viewed as a potentially hazardous object. 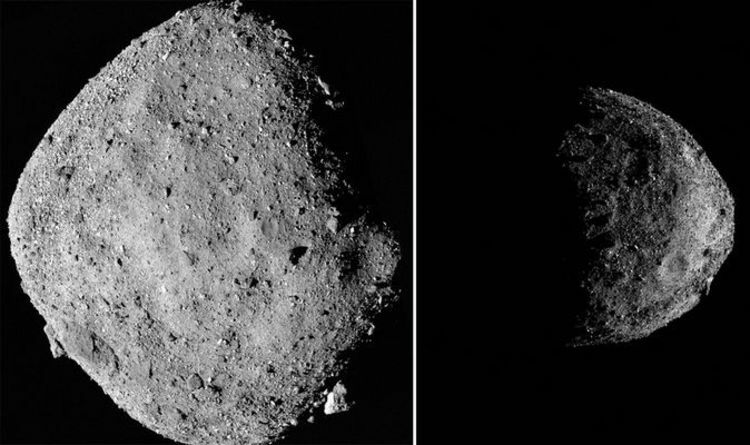 Detailed photographs of the asteroid’s surface were released when the OSIRIS-REx NASA spacecraft arrived there three months ago. But one man has claimed that the mysterious object is also home to alien “buildings, towers and pyramids” that NASA doesn’t want you to see. UFO hunter Scott C. Waring detected the alleged presence of alien technology on the space rock’s surface while examining a new photo released by the agency. Detailing his findings in his blog “UFO Sightings Daily”, Waring noted that while the asteroid is “littered with rocks”, the picture also shows certain “black or silver objects” which are “more interesting than NASA wants you to know”. He added: “These structures are on Asteroid Bennu and show buildings, towers, pyramids and even some abandoned ships. Mr Waring proceeded to highlight various rocky outcrops on the asteroid’s surface. But NASA has dismissed the “discovery” a product of pareidolia – a psychological phenomenon where people see recognisable shapes in clouds, rock formations, or otherwise unrelated objects or data. But NASA did make its own unusual discovery about Bennu. The US Space Agency noticed “particle plumes erupting” from the asteroid’s surface. The discovery of the plumes comes from the un-crewed OSIRIS-REx NASA spacecraft, which started orbiting Asteroid Bennu on December 31 last year. NASA has yet to confirm exactly what the ejections are comprised of. But the space agency has revealed while some plumes erupt fast enough to escape Bennu entirely, others are recaptured by Bennu’s gravity. Dante Lauretta, a principal investigator on the NASA OSIRIS-REx mission said: “The discovery of plumes is one of the biggest surprises of my scientific career. “And the rugged terrain went against all of our predictions.